First touch soccer drills should play a very important part in every soccer players training routine. First touch soccer drills are a simple way to improve any player’s first touch on the soccer ball through repetition, and constant training. Doing activities with the soccer ball on a daily basis will greatly improve youth players first touch on the ball. Having a good first touch will allow the player to be able to get out of small spaces, or trick the defenders with the first touch turn or pass. This will create more goal scoring chances, and keep the flow of the game exciting. Players that do not have a good first touch on the soccer ball will take too many touches trying to bring the ball under control, giving the other team’s defense time to organize, and take the ball away. Learning how to control the soccer ball with the first touch, will lead to creating more space for the players. One of the main soccer exercises any player is able to do individually is simply juggling the soccer ball. Juggling the ball will improve the players balance, and coordination with the ball, as he/she hops on one foot while maintaining balance, and controlling the ball in the air with juggles. Juggling will help with footwork, because of the foot and ball coordination required to juggle the ball. Juggling is one of the simplest ways for players to develop various skills, and have fun with the ball. Try and beat your maximum number of juggles, my maximum is 1361. Like any skill in soccer, first touch is developed with consistency, repetition and playing time. Soccer is a fun game, and individuals can train off the wall, garage, or rebound goal, having a good time with the ball always coming back. Every soccer drill should be done with both feet. Even when playing soccer, remember to use your weaker foot. Use the correct technique to control the soccer ball, and pass it back through a different set of cones. This first touch soccer drill will develop the mental part of the player's game, with the player having to think about where they want to move, and where they want to pass the ball back. Split players into groups of 2, with one soccer ball. Set up 4 cones in a straight line with 1 m/yd of space in between them. Players will position themselves on each side of the cones, 10 m/yd away from the cones. Player with the ball will start this drill by passing the soccer ball through one pair of cones, using the correct technique, toes up, ankle locked, firm pass on the ground. Player receiving the soccer ball cannot pass the ball back through the same set of cones. Player receiving the ball will have to take one touch to the left, or right, and pass the ball back through a different set of cones. Players will try to find a rhythm going back and forth without knocking over the cones, or passing through the same set of cones. 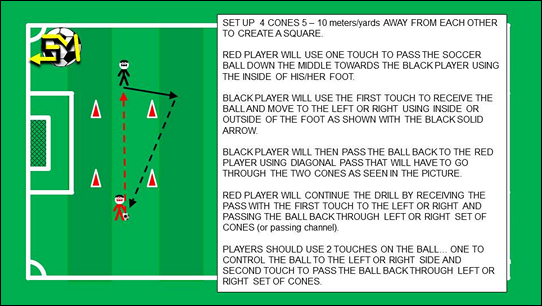 Control the ball with the first touch into space, left or right, and pass it back through a different set of cones. 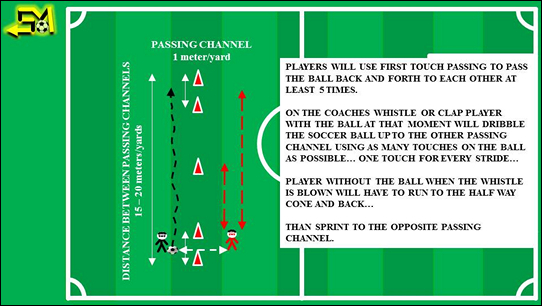 Add more cones to make more passing channels and make it more difficult and interesting. Lessen the distance between cones to make this drill more difficult with smaller sized passing channels. Always practice with both feet. This soccer drill can be done in practice, or out of practice with friends or parents. Players will develop better overall touch on the ball, and learn the positive habit of always running toward the pass, instead of waiting for the soccer ball. Two players and a soccer ball are needed for this drill. Place 2 cones, shoes, backpacks or any other marker about 1 meter/yard apart. 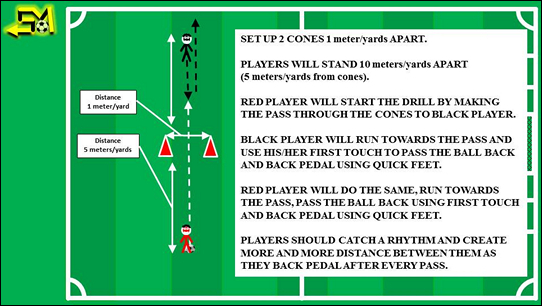 To start off, players will want to position themselves about 10 meters/yards away from each other or 5 meters/yards away from the cones. Player with the soccer ball will start this drill by making a firm pass on the ground through the cones towards the player on the other side. 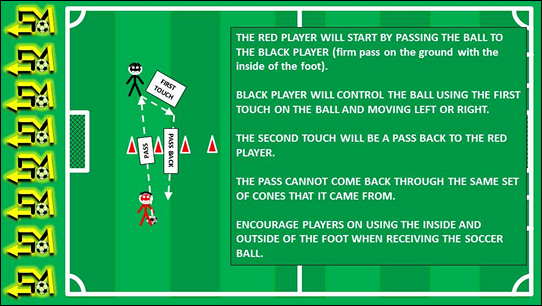 The player receiving the soccer ball will RUN towards the ball, and use the first touch to pass the ball back through the 2 cones, and start backpedaling 3 - 5 steps back. Player on the opposite side will run towards the ball to make the pass, and back pedal. As the rhythm of the passes becomes consistent, each pass will create more distance between players as they back pedal after every pass still trying to keep the pass inside the cones. If the pass is made outside of the cone channel or a cone is knocked over, players will start the drill over with 10 meters/yards of distance in between them, passing and back pedaling their way back. Player’s main focus should be making the first touch pass with the correct technique, body over the soccer ball, ankle locked and toes up. Another important part in doing this drill correctly is making sure that the players use quick feet when pedaling back, instead of long strides. Quick feet mean that players will try to get as many touches on the ground as they are pedaling back after the pass… instead of trying to cover as much distance, and making big steps back. Modify this soccer drill with receiving, or mid air passing. Players will have 2 touches, 1 to receive, and 1 to pass. Make this soccer drill more difficult, or easier, by reducing or expanding the passing channel. ALWAYS PRACTICE USING BOTH FEET (left and right). This first touch soccer drill will work the players first touch on the ball while in motion, or running with the ball. Players will work on their coordination, conditioning and response time. Players will work in groups of 2 with one soccer ball. Players will jog towards the ball, make a pass, and back pedal. Always staying on their toes and using the correct technique to pass the soccer ball, body over the ball, toes up and ankle locked. On 5th, or 10th pass, the player with the ball in his/her possession will start dribbling the soccer ball with as many touches as possible, towards the other passing channel. Player without the ball will sprint to the middle cone, back to the starting cone, and then to the opposite passing channel. Players will benefit from this first touch drill by developing the habit of playing simple soccer… receive, move, pass the ball, and move again. Players will also be developing their first touch on the soccer ball, both offensively and defensively. Players will position themselves on the outside of each end of the square. Player with the soccer ball, red player, will start this drill by making a one touch pass through the center of the cones to his/her teammate on the opposite side of the gird. This pass should be made using the correct passing technique, eyes on the soccer ball, toes up, ankle locked, firm contact on the ball. Player receiving the soccer ball will use the first touch to control the soccer ball to the left or right side, making sure that the first touch control gets the soccer ball to the outside of the cones. Make sure that the players are using the correct technique in practice with every soccer drill.